The Economist’s ‘Intelligence Unit Democracy Index’ (https://www.eiu.com/topic/democracy-index) which provides a snapshot of the state of democracy globally has ranked Norway in the top of the list as a “full democracy” while Sri Lanka is ranked as a “flawed democracy” towards the bottom of the rankings though Sri Lanka defines itself a “Democratic Socialist Republic”. Several factors are said to be considered in giving these rankings. What is striking though is that features in the constitutions of countries have been conveniently omitted and all factors taken into account are highly subjective. In this scenario analysing some of the salient features of the top ranked “full democracy” Norwegian Constitution makes interesting reading. Article 1 – The Kingdom of Norway is a free, independent, indivisible and inalienable realm. Its form of government is a limited and hereditary monarchy. 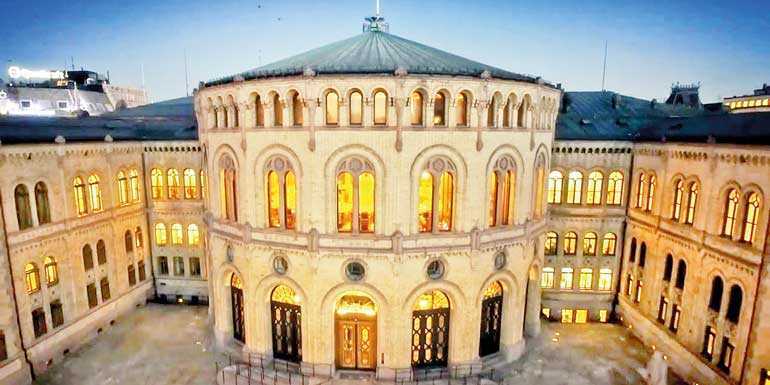 According to Article 2 – The values of Norway will be based on its Christian and humanist heritage while saying it will ensure democracy, a State based on the rule of law and human rights. Article 4 stipulates the King shall at all times profess the Evangelical-Lutheran religion. The King’s person cannot be censured or accused and the responsibility rests with his Council as per Article 5. The Prime Minister and the other Members of the Council of State, together with the State secretaries, may be dismissed by the King without any prior court judgment, after he has heard the opinion of the Council of State on the subject, according to Article 22. The same applies to senior officials employed in government ministries or in the diplomatic or consular service, the highest-ranking civil officials, commanders of regiments and other military formations, commandants of fortresses and officers commanding warships. Article 24 – The King chooses and dismisses, at his own discretion, his royal household and court officials. Article 75(m) devolves power upon the Storting: to naturalise aliens. d) or have been naturalised by the Storting. Others may, however, be appointed as teachers at universities and institutions of higher learning, as medical practitioners and as consuls in places abroad may be appointed. This proves “democracy” is malleable, has no universal definition and can be manipulated using it subjectively, to enhance or relegate the standing of any country in the eyes of the public of that country and the world at large. What would the “democratic world” say if one were to argue that our country, to become a “full democracy,” must enshrine in our Constitution a clause to have a leader who will always profess a particular religion and that all Executive power must be vested in him? Additionally, if we place a rule in our Constitution to enable only citizens who speak a particular language, to hold high public office, will everyone applaud? All of the above and more on similar discriminatory lines would have to be carried out if we were to bring our Constitution in line with that of Norway, which is currently hailed as the greatest democracy in the world. This leaves no doubt that any attempt at becoming a “full democracy” by emulating the “democracies of the highest standard “is not possible and the goal posts can be shifted in any manner that the “patent holders of democracy” wish. Thus, we cannot question when the “patent holders” say what is contained in a Constitution has nothing to do with democracy, while insisting that we keep on changing our Constitution to make our country more “democratic “ even at the risk of decimation. Therefore, it would be far better for us to define ourselves as a Buddhist republic that follows the true tenets of Buddhism which rejects all forms of discrimination against all religions, races and individuals and say that we stand for the promotion of equality, equity, compassion and loving kindness towards all living beings as preached by the Buddha. In fact when we a “Buddhist Kingdom” prior to 1815, the Buddhist Kings of Kandy and the Buddhists provided safe havens, firstly to Muslims, against persecution by the Catholic Portuguese and thereafter to the Catholics themselves, when they in turn were persecuted by the Protestant Dutch. The Meera Makkam Muslim Mosque standing at the foothills of Asgiriya, donated and dedicated to the Muslim community by the Asgirya Buddhist priests is only one out of the many testaments of the practically demonstrated true spirit of pluralism and tolerance of a “Buddhist Kingdom” in contrast to the “democracies” of today where laws have failed even to prevent religious and racial violence. The creation of such a Republic which has inbuilt principles of “goodness” rather than artificially touted ones, will no doubt help us to seek the ultimate aim of a truly happy and contented society. At least then, we can aim towards goal posts owned by us, which are fixed and cannot be shifted by outsiders. The ability of the “patent holders of democracy” to lump all what has been preached as good from ancient times under the banner of “democracy” and insist they have the right to decide what is good and bad for us can be prevented.